« Are we Amish now? It is kind of hard for me to review this book, I would have loved to put the time into writing it myself. 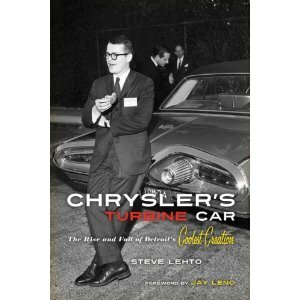 However I am content to have had a small part in the creation of the most definitive compilation in print on the Chrysler turbine program. Steve Lehto is a master of making history into a readable and interesting dialog with the reader. I knew most of the story from my own research and acquaintance with many of the contributors before Steve started. So when I say I found the book extremely well written and able to capture and hold my attention, which means it is just plain good! Bravo Steve for giving the world a record in print of not only the unique cars but the people who created then and had the chance to drive them. I received my copy from the publisher and found it hard to put down. I knew how it ended and as I said, I knew most of the story but the chronological and flowing of the way Mr. Lehto put the whole book together made it an absolute joy to read and remember. If you count yourself a “gear head” of any age and love to read a lot of “inside” information about technology and vehicles in particular, you must read this book! If you enjoy stories about people who were dedicated engineers, visionary designers and creative dreamers, you need to read this book! History can be boring and dry or it can come alive, Steve has brought life back to a story that should have been told so our children and grandchildren can know that the 60’s were not only about peace protests, the Viet Nam war, assassinations and bad corporations. Mr. Lehto shows that innovation and concern for the future was a common theme running through the people who wanted to see the piston engine replaced by an exciting and wonderful engine – the turbine. This entry was posted on	September 21, 2010 at 9:24 pm	and is filed under Uncategorized.